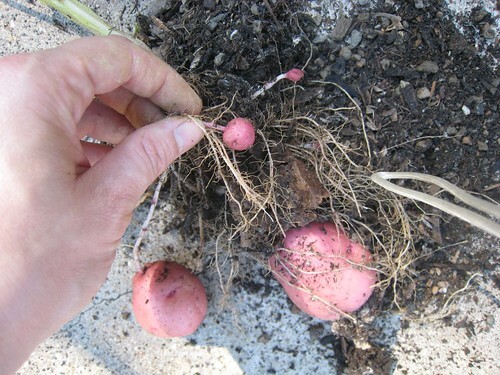 Red Lasoda Potatoes on Plant, originally uploaded by espeedy123. 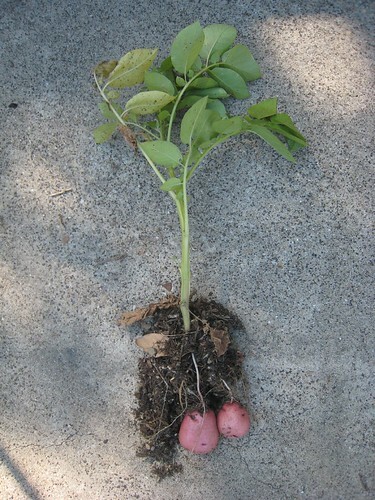 Yesterday I pulled up my first potato plant. 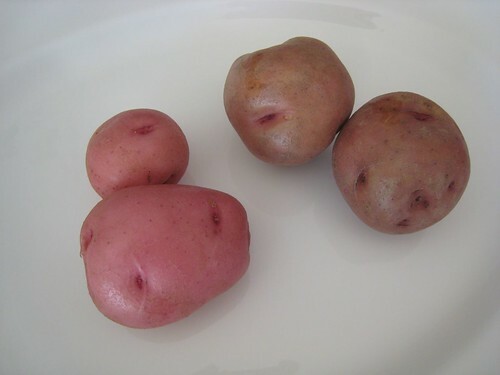 To my delight there were two perfect little red potatoes on it! Red lasoda, to be precise. For some reason I was a little shocked. This is my first potato rodeo, so perhaps that’s why. I hadn’t planned on pulling these up, but I found myself wondering when these would be ready to go, so I just grabbed one. 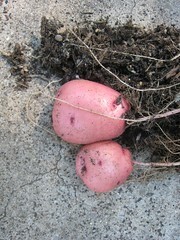 Earlier in the day, I had purchased a few new potatoes at Whole Foods. What an excellent opportunity for comparison! I set up a taste test and steamed both sets. I was nervous mine might not taste a lot better. But there was no doubt, the fresh ones were about a billion times tastier. They had a much creamier, more potato-ey texture and taste than the ones from Whole Foods. The store bought ones had a bitter aftertaste that I probably wouldn’t have objected to had I not tasted the better ones. I have probably thirty total plants that include two other varieties in the garden that should be ready to pull in the coming weeks. 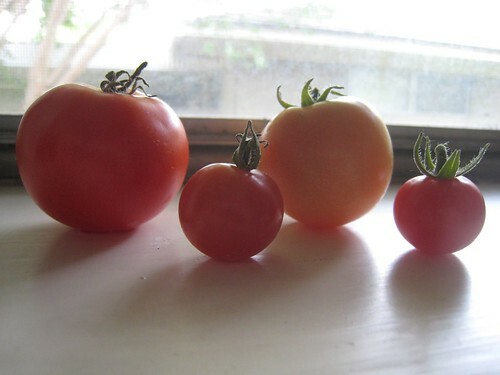 First Tomatoes, originally uploaded by espeedy123. 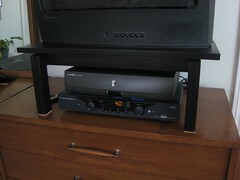 New TV Riser, originally uploaded by espeedy123. Is there any more important DIY pursuit than that which improves one’s ability to appreciate TV? 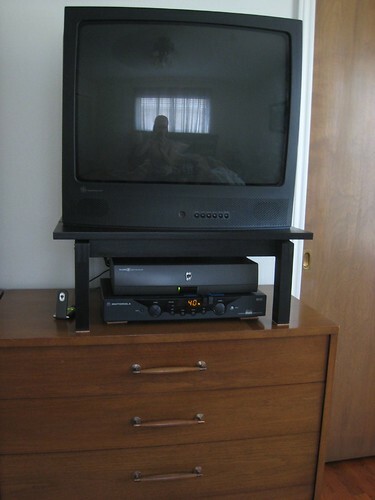 I have not yet invested in a flat screen TV. Here in the bedroom, the TV I bought back in college at a Wal-Mart in Austin is still kickin’. It has traveled the country and seen the inside of more moving trucks than 99% of America’s TVs. I will never forget how my friend Jay, who was helping me load furniture into a U-Haul truck during afternoon rush hour in NYC, dropped it onto the Fifth Ave. sidewalk in front of my building. I was upstairs at the time. Jay felt so guilty and said it even bounced a bit. There’s barely a dent on one corner to show for it. And you would never know any of it happened from the excellent picture. Anyways, a recent changeup of furniture in the bedroom meant that this TV was sitting about a foot lower than previously. This was a bit of a bummer, and it especially irked Michael who found it much more difficult to see. I searched for an inexpensive way to lift it up. The solution had to be cheap, otherwise why not just buy a flat screen and retire the old TV to a lucky person on Craigslist. 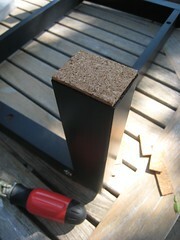 At first I got excited about this blogger’s plywood and PVC monitor riser solution. I priced out materials at Home Depot and it looked like this was going to cost me $25 and quite a bit of time. Then, I found an easier and more elegant solution: the LINDEN table from IKEA, chopped off at the legs to perfectly accommodate the TiVo and cable box. It comes in birch or black. It has a slight Asian aesthetic to it. And at $29.99, the price is right. I used a hacksaw to chop off the legs and glued some thin cork on the leg bottoms.